If you come home after a 8 or 10 hour day and do the same stuff as you did at work – it’s probably a dream job.“ Edgar Heinrich, Head of Design BMW Motorrad. 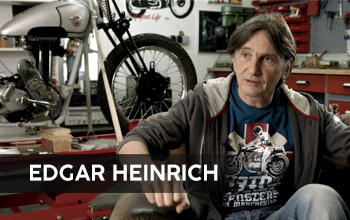 The movie introduces Edgar Heinrich and gives an insight into his work. It describes some of his personal highlights, his passion for sketching and his opinion on mechanics nowadays. It's a must watch to get a little insight into what goes on in a Motorcycle Designer's profession.